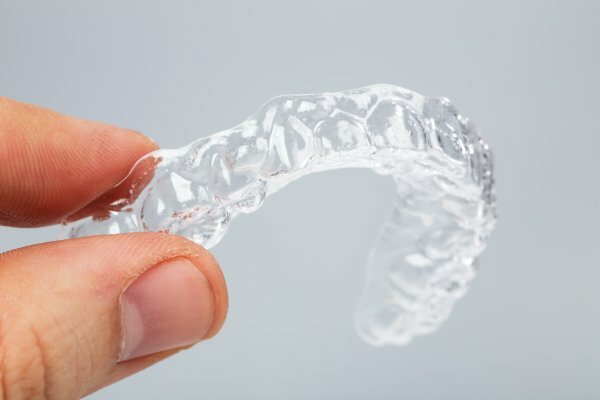 Learning how to conduct proper Invisalign maintenance is a must when you start wearing clear braces. 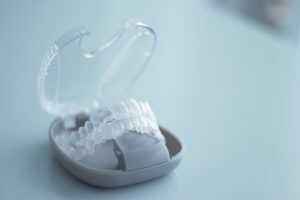 These dental prosthetics are used to fix a variety of orthodontic issues, and they are quickly becoming the preferred type of braces. Traditional braces have been the norm in orthodontics for decades, but these devices are highly visible in the patient's mouth. It can lead to people feeling self-conscious about their appearance. With clear braces, it is now possible to straighten teeth without compromising the patient's appearance. Proper Invisalign maintenance is necessary since these devices are susceptible to bacteria buildup. It can also trap food particles on teeth while preventing saliva, which is a natural teeth cleaner, from washing it away. Clear braces not being adequately cleaned can lead to bad breath and tooth decay. One of the first things patients should do after waking up is clean their mouths and the aligner tray. Bacteria builds up on both as the wearer sleeps. Cleaning teeth and the tray should also be the last thing the patient does before going to bed. Clear braces should be rinsed with water whenever they have been removed before reinserting them. Rinsing helps in washing away dried saliva and some of the bacteria on it. Always rinse with cold water since hot water can warp the fit. Patients are advised to brush and floss after each meal when wearing clear braces. Food particles can get stuck between teeth during meals. Putting the aligner back in without cleaning them means these particles get to stay on teeth and be converted into acids. The acids are free to damage teeth since saliva cannot get to the tooth to clean it. Clear braces should be soaked in denture solution or clear aligner cleaner each day. A toothbrush should be used to clean the aligner when it is removed from the solution. It should be thoroughly rinsed afterward. People who wear clear braces should keep a case that the tray can be stored in on them at all times. This helps to keep the device clean and safe when it is removed. When trays are left out, they should be thoroughly cleaned before being reinserted. Clear braces should be removed before meals. It prevents food particles from getting stuck on the device, and it also helps to avoid staining. When clear braces become stained, it becomes easier to detect them in the wearer's mouth. Clear braces should never be cleaned with toothpaste. That can lead to discoloration, making the device a lot more visible. Only clear braces crystals or denture solution should be used to clean the trays. We are always here to help with your Invisalign maintenance. Contact us today! Ready to treat your alignment issues? Schedule a consultation with one of our dentists today. Request an appointment in our Woodland Hills dentist office here: https://www.woodlandhillsdentist.org.